A view from the cycle path: Maintaining priority in the countryside. How a route between a village and a city can be made extremely attractive for cycling. Maintaining priority in the countryside. How a route between a village and a city can be made extremely attractive for cycling. On longer trips between towns, it's also important to maintain priority for cyclists so that journey times are not made excessively long. 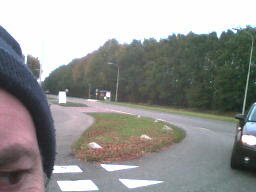 This junction is on the main cycling route north from Assen to Vries. Note how the concrete surface of the cycle path, which is smoother than the asphalt surface of the road, continues through the road rather than the other way around. Also note the prominent give way markings (triangles) so that motorists are in no doubt about who has priority at this junction. The raised areas with red paving prevent motorists from cutting the corner. The corner radius on the road here has been made deliberately sharp in order to slow down motor vehicles entering or leaving this side road. Minimum of 2.5 m wide cycle path (on both sides of the road, as each side is unidirectional). Surface of concrete or asphalt with no or little roughness (but enough that you don't slip, of course). On the back it reads "Cycling in Drenthe gets still more enjoyable and safer. 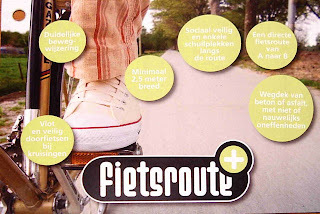 Several cycle paths in our province are being upgraded to a Fietsroute+. Assen to Vries is the first"
"As well as the cycle path, the bus stops along the route are being improved. There is more room for parking bikes and later this year new shelters." This stretch has been completed for some time, and work is now taking place on improving other routes to the same standard. The effort put into these paths pays off in allowing cyclists to ride very quickly, take a direct route and to do this in great safety. The road which is paralleled by this route has an 80 km/h (50 mph) speed limit, but has relatively little traffic due to not being the signposted route for drivers and due to there also being a motorway which offers drivers the choice of 120 km/h. The cycle path itself isn't new. Even having priority over side roads is not entirely new. This is an upgrading of an existing facility. This photo shows a junction on a cycle path alongside the same road some way north of Vries. This stretch had not yet been upgraded when this blog post was originally written. The older junction had some roughness as you rode over it due to cyclists having to use the less smooth surface used for minor roads relative to that used for cycle paths. With the upgraded cycle-path surface, the difference is even more extreme. Here's an example of a van driver giving way to the cycle path. In this photo you can see clearly how at this junction the cycle path remains on the same level while drivers who wish to cross it have to go over a bump caused by the different levels. This photo taken over my shoulder at an older junction shows a driver giving way as he turns into a side road. 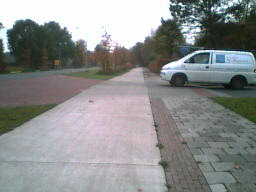 You can see how the cycle path is apart from the road at the point of the give-way. This allows space for one car length between the road and the cycle-path. Finally here's another photo of one of the newer junctions. It's not the same one as in the top photo, though it looks virtually identical. These routes are extremely popular, both with commuting adults and with school children. A very fast friend who lives around the corner from me travels 30 km each way along this route to get to work in Groningen. At the same time, parents have few fears that their children will not be safe travelling on such a well engineered route. How successful is this route ? This section of cycle-path links a village of just over 4000 people with a city of 65000 people. While the target population for this cycle-route is not huge, this route is so attractive as a means of transport that more than a thousand cycle trips per day are made along. That is success. The fietsroute+ features from one minute into this video. The preceding minute is of a secondary route which bypasses the city centre. Read other blog posts about how cycle facilities in this country help cyclists to make more direct, faster journeys. Two other posts about this route show school children commuting along it and going along in a velomobile at 40 km/h. Facilities like this are for every cyclist, fast, slow, young or old. Read more about fietsroute+. The route features on our Cycling Study Tours. However, if you're impatient, you can get a glimpse of what it looks like to ride along it by looking at a series of stills and films that I put online here. My opinion is that path continuity and priority at junction is what makes Dutch cycling infrastructure so good and unique: you're moving in a "complete network". 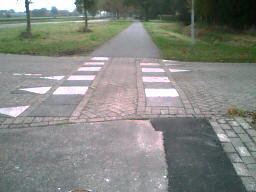 Whereas elsewhere, cycle paths are often just crap, with little pieces here and there. The Cycle Facility of The Month shows it too well. In that case, I think that's why cycling advocacy groups tend to be very skeptic of segregated paths, because they know it will be very done in a very ineffective way for cyclists, who will have to give way every 50m or so. Colibri, I think you're absolutely right. I find I cycle distances here much quicker than I ever did in the UK. Riding on the cycle paths here vs. roads in the UK, I have many advantages. The surfaces are generally better, the routes are more direct (because I'd usually avoid A roads in the UK because they'd be unpleasant, but you can pick any route you like here), and you only very rarely have to put your foot down and stop. There is none of the give way every 50 m nonsense. Before I started visiting this country, I was as skeptical as anyone could be about cycle paths. Britain's attempts at cycling provision have nothing in common with the Dutch way of going about it. As for shared space, well you probably have already read my opinion of it. I've been asking other people whether they like it and have yet to get a single positive response. Sometimes (as here) what you write makes me feel almost sorry for poor Dutch car drivers. Well, it would, were they not mostly bike riders as well - and therefore beneficiaries as well as sufferers. @ Nick, As far as I know every car driver is not only taught to be careful around vulnerable road users: children, handicapped people, eldery people, pedestrians, cyclists etc. For example, at zebra crossings, a pedestrian who is still meters away from the crossing, but shows the intention of crossing has priority. Seriously! It's just taught in the driving lessons that cars can be vey dangerous to others, and that means responsibility for the driver. I don't think many, if any, drivers resent cyclists when they have to give way to them, it's just something that makes sense: protect the more vulnerable. It is so amazing to see how your country accomodates bicycles. Something like this is so far from the mindset in the United States we can't even dream about it. Good point: Cycling is a rural as well as an urban form of transport. Indeed it is. If you look at the stories with the rural tag you'll see other things which have an effect in the countryside.